I rarely cared about power when I used a desktop PC, but when I migrated to MacBook Pro, I cared a lot. I used to take my MBP out for some events or discussion with friends, I needed at least 5-6 solid hours for browsing. But most of the time, it gives just 2-3 hours, or maybe 4 maximum. I was really disappointed. I tried several tweaks to improve my Mac’s battery life, but yet, at the end of the day it gives what it gives, maybe few minutes extra. I don’t want to blame Apple for this, my MacBook Pro is almost 3 years old. But yet, I checked the battery condition and battery cycle count, they are totally fine. Which Application Drains Power On Mac OS X? 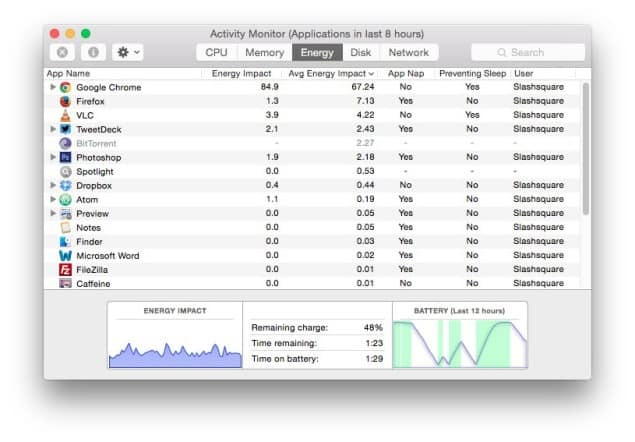 Go to “Activity Monitor” (You can use Spotlight Search) and migrate to “Energy” tab. It will show the applications in the last 8 hours. The Energy tab will show the ‘Energy Impact’, from which you can easily find out which application drains power on Mac OS X. As you can see on the window, it was none other than our very own Google Chrome. 😀 It was not really surprising to be honest. But, I somehow feel comfortable with Chrome browser and I’m not really able to avoid it. I tried Firefox and Safari as well, but nothing gives me that ‘Google‘ experience. I’m using Chrome for both my desktop and mobile browsing, it’s very hard to move from this. Google recently teamed up with Adobe Flash for better laptop battery life, so I’m gonna wait for some time. So did you try this on your Mac device? Did you find out that power draining culprit? Do share the app names in the comments below, or if you have any issues with the steps, feel free to let us know as well.